This site presents the results of experiments I am doing on how smoothing planes can be brought to their highest level of performance. The Effect of Chipbreakers A closely set chipbreaker can affect the characteristics of both the surface planed and the shaving produced. I’m trying out several angles for the chipbreaker edge and setting the edge at different distances from the cutting edge of the blade to see what works best for a variety of wood species. Optimum Mouth Dimension Closing down the mouth is an effective way to reduce tear-out. I’m looking for a mouth dimension that prevents tear-out without causing the shaving to jam. Cutting Angle The cutting angle of the blade edge is an important factor in how a plane performs. I’m using back bevels to test the effect of increasing the cutting angle when planing difficult species. Shaving Formation What actually happens at the blade edge as it takes a shaving? I’m comparing shavings in the hope of being able to deduce the type of cutting that is occurring in different situations. I have a related site that describes my efforts to compare the various types of steel that are used in plane blades. The link below will take you there. 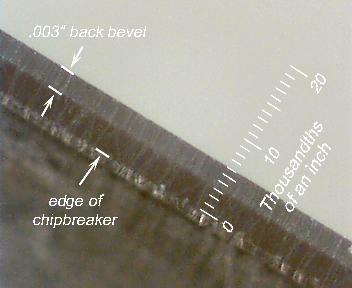 The chipbreaker edge is set at a distance of .006” from the cutting edge of the blade. After only a little practice I have been able to set the chipbreaker within +/- .001” using nothing more than a strong pair of reading glasses. It’s not necessary to have a microscope to adjust a chipbreaker accurately. In the image above, the light-colored band .001” wide just behind the chipbreaker edge is a microbevel at 75º that the shaving hits as it slides up the blade. Viewed end-on, this microbevel is about .005” wide. A narrow mouth greatly improves the surface produced when planing against the grain. Smoothing planes can work well when the width of the mouth is as small as a few thousandths of an inch. Achieving this fine a mouth involves careful tuning of both the blade and the plane body. In the scan above, the mouth dimension is .008 inches. I believe a mouth only half this size would be better for a dedicated smoothing plane. This scan shows both the overall shape of the shaving and the state of the wood. In this case the shaving is curly, slightly rippled, and shows no breaking of the wood fibers. 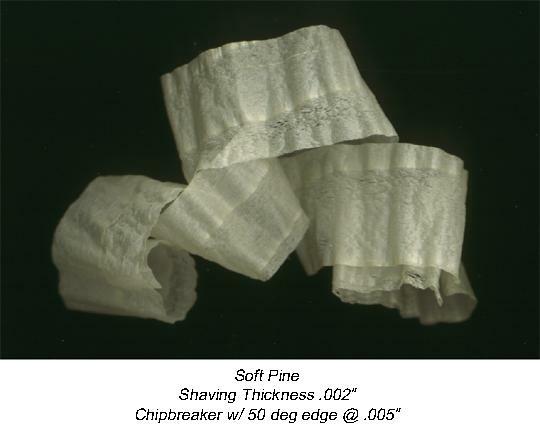 This is known as a Type II shaving, which is typical of thin shavings made by smoothing planes with standard bed angles. For the system used to classify shavings, see the page Shaving Formation. Both the surface of the wood being planed and the shaving produced are affected by what happens to the wood as it is being cut. Sometimes the wood splits and breaks, other times it bends without breaking. Close attention to the shaving that has been cut can give a good idea of what type of cutting action is taking place. This is called a Type II chip (or shaving). It is the type of cutting that produces a curly shaving that is not broken into segments, as often happens when a thicker shaving is cut.